The past 24 hours have been tough. Very tough indeed. I may have reached my foodie limit. For I have consumed two very large, heavy burgers along with some not insubstantial other meals and some luxury gelato. I type this having awakened from a burger-induced slumber, although I’m struggling to reach the keyboard as my burger-belly is making tucking the chair in very difficult. Oh, all right – I give in! I LOVE burgers and there’s no such thing as too many! It was an awesome 24 hours…or 18 hours to be more precise! 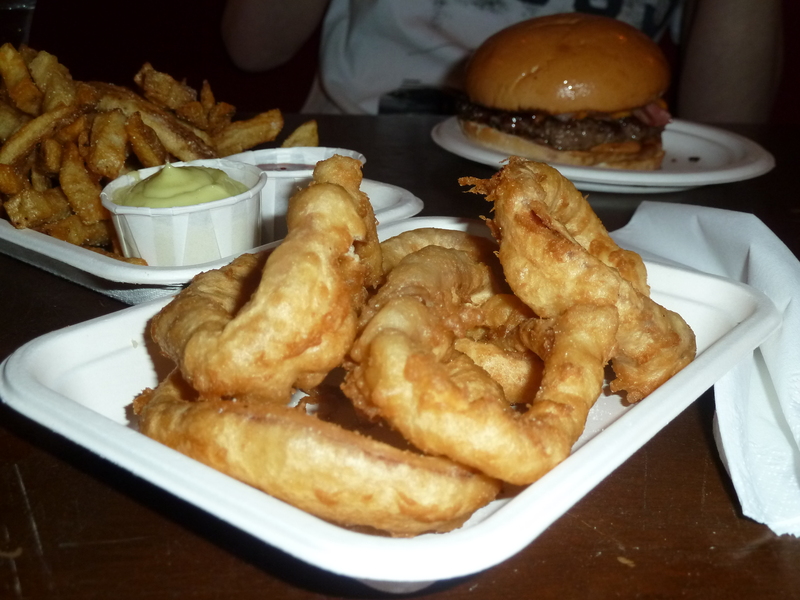 It started with an adventure on Friday night to visit Lucky Chip, who are somewhat legendary on the London burger scene and are currently residing in the Sebright Arms in Bethnal Green. 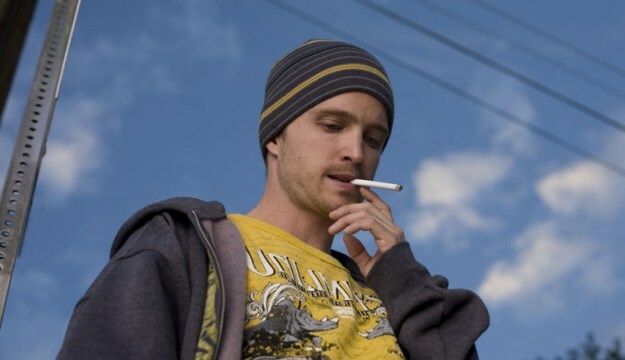 They recently caused quite a stir with a Breaking Bad menu. Check out what they were ‘cooking up’ – sounds enough to make any foodie high. What is that, you ask? This is a burger with PEANUT BUTTER and JAM (yes Americans, it will never be jelly to us). But it doesn’t stop there. It has the classic accompaniments of bacon and cheese, and some seriously hot red chillies. What did it taste like? Well, to be honest, as weird as it sounds. 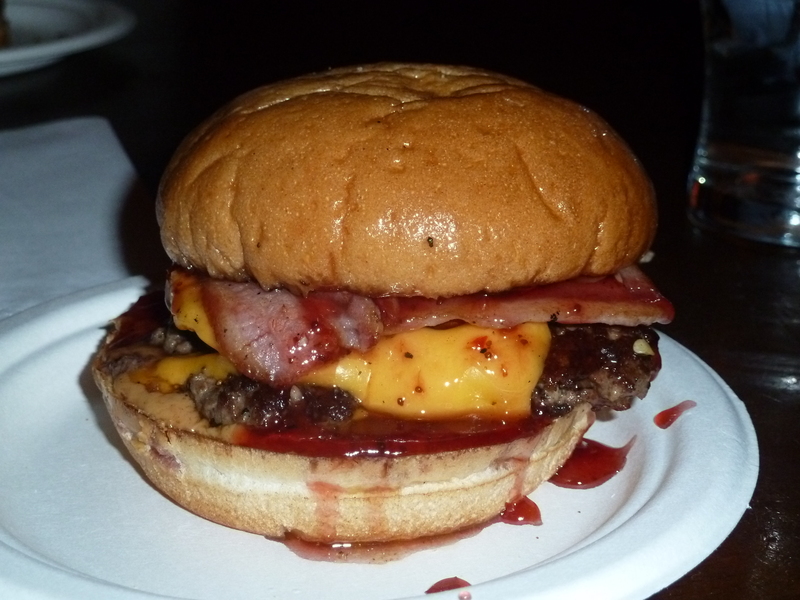 The jam had almost no flavour at all, which meant that this burger was a complete salt-fest. I mean, it contains peanut butter and cheese and bacon – how could it not be salty? Still, I did love confusing my tongue; what’s that motto – try everything once?! 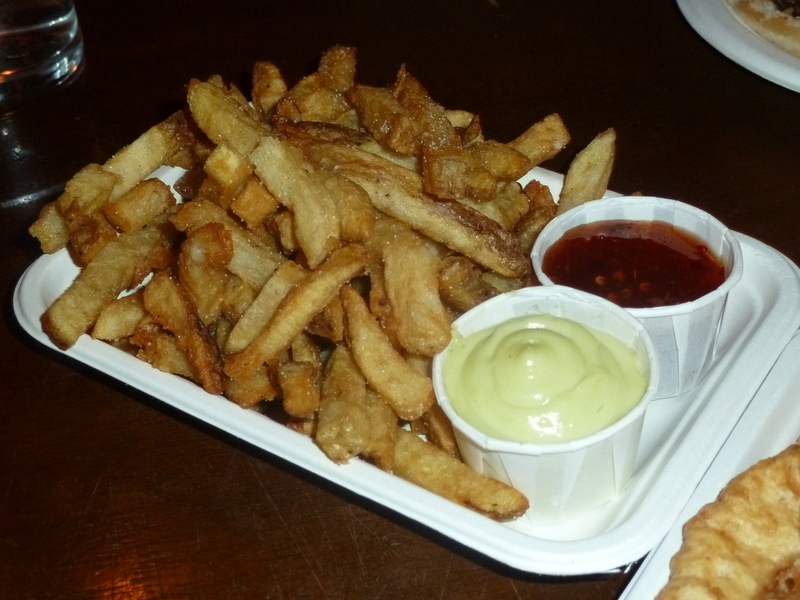 We also had some beetroot-flavoured onion rings (£4), which were not very beetrooty and disappointingly soggy, but Lucky Chip need to be commended for their chips with sweet chilli dip and wasabi mayonnaise (£4). Particularly the wasabi mayonnaise. This is a very good thing. Unlike wasabi ice-cream, which I recently bought from the Japan Centre, and which was just jarringly wrong. 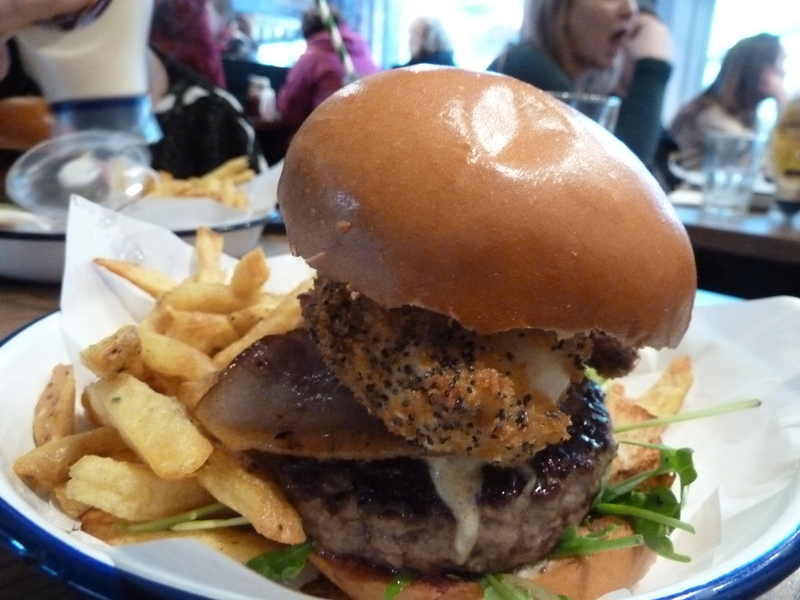 Will definitely be back to give Lucky Chip another try – watch this space for a review of their normal burgers! For a much more palatable burger, I highly recommend Honest Burgers’ Christmas special, which I sampled at their Camden Lock branch. 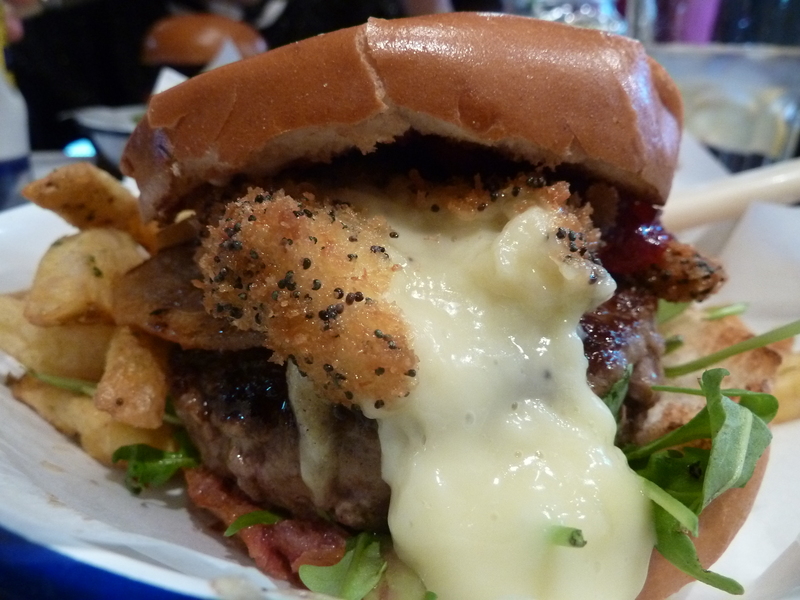 This is a juicy patty made from Ginger Pig beef (food snobs, you know what I mean), with deep-fried Camembert, cranberry sauce, smoked bacon and rocket, served with their legendary rosemary chips (£11). When served to me, the waiter told me very proudly how it was best to squash the burger down so the very hot, gooey Camembert cheese coated the whole burger in its beautiful, cheesy goodness. This man was not wrong. What a frickin’ genius burger idea. I find Camembert quite strong but who can resist it when deep fried? With cranberry sauce? If I had to be picky, I could’ve done with a tad more cranberry sauce. But this honestly was a delight. Honest Burgers are expanding their burgery empire and can now be found in four locations: Brixton, Soho, Camden and Portobello. Check their website for details.